praxis of sealing in administrative and economic contexts. I am currently writing my PhD on the glyptic material found in Tell Chuera, Syria, dating to the 3rd millennium BC within the Research Training Group “Value and Equivalence”. Objective of my work is in first instance to give a detailed overview on the mostly unpublished material that has been excavated within the last 60 years. It includes beside an iconographical analysis a determination of function of the impression carriers. Since several of the sealings made of clay were baked after being opened, I furthermore examine this praxis. Glyptic studies in Near Eastern Archaeology have since its beginning focused on describing and classifying motives to use them as chronological anchor and to prove cultural contacts between distant regions. Whenever anthropomorphic and/or zoomorphic figures are depicted the scenes are interpreted based on comparisons from Hellenistic times, which are up to 3000 years apart. Alternatively, they reflect the researchers personal point of view on the status of the “culture” in question, highly developed, or paltry, often given ex nihilo. These definitions are nevertheless well established and found their way into the descriptions. This compulsory leads to a vicious circle. Although in recent years the willingness for interpreting glyptic motives has decreased, no new attempt has been carried out to work on the material. To break out of this circle I am looking forward to discuss my topic with other that are not trapped in it. The Blurred Lines workshop is an ideal place for me to discuss and work out alternative methodological approaches that can spread new light and insights into the studies on glyptic in general and my own work in particular by broadening the spectrum of research questions. I am an Italian PhD student, pursuing my post-graduate career in Ancient History at the University of Santiago de Compostela (Spain). I am currently completing the final draft of my doctoral dissertation, which focuses on sacred geographies and archaeological landscapes of Ikh Bogd Uul Mountain, in Mongolian eastern Altai. In particular, thanks to four extensive surveys, spatial and statistical analyses in the laboratory and an accurate bibliographic research, I investigate the localisation of prehistoric funerary mounds in relation with both ancient and folk cosmologies, ritual behaviours and pastoral practices. For instance, I compare the localisation of mounds near modern paths, rivers and springs with the traditional pastoral mobility of the semi-arid landscape of Mongolian Altai Mountains. Similarly, I consider the definition of sacred spaces through prehistoric funerary mounds, and its value in different sacred geographies along time, such as in the case of Buddhist sacred landscape. In addition, I explore possible archaeoastronomic alignments of prehistoric mounds through the lens of traditional orientation systems and cosmological conceptions. In my archaeological research, I therefore try to maintain a continuous dialogue with anthropological sources and methods, in order to build a post-colonial, ethical and ‘localist’ research frame, as well as a comprehensive and enriched archaeological interpretation. Nonetheless, in doing so, I constantly face with two main problems that I expect to examine closely in the workshop, as they apparently are two sides of the same coin. On one hand, in fact, holistic, long-term analyses about ritual and cosmological concepts are generally dismissed by archaeologists, in favour of a focus on classification and exact chronology of cultural and material changes. On the other side, the same perspective is criticised by anthropologists, who underline the high variability and unicity in time and place of the cultural traits of local communities. I am looking forward to discussing the practical ways I used to escape this epistemological and methodological impasse and exchanging inspiring views with other researchers. Thanks in advance for your kind interest. Research of unknown worlds has a huge potential of being unsettling. Paradoxically, so much research in anthropology and archaeology seems to yield results that are not different, but more of the same. Researchers are preyed upon by existing disciplinary constellations, reproducing preconceived notions of the unknown. Working symmetrically could mean a reinstatement of the unsettling potential of research, thereby challenging researchers to put themselves at risk. The risk to which I exposed myself in my PhD project was the tension between grand narratives and case studies. This made for a slow form of archaeology, an attempt at incorporating thick description in archaeological synthesis of Bronze Age Central Italy. Different from the abstract narratives of synthesis, the data-rich approach that I adopted helped assemblages of objects to disclose inconsistencies – uncertainties and controversies –, to the extent that even something so fundamental as a chronological framework could be questioned. Because of the challenging scope and slow character of this research I have not come unscathed from the project and have not published all results yet. I am particularly unsatisfied with the asymmetry that remains in my attempt at synthesis. This dissatisfaction partly derives from the tension with case studies, inherent in synthesis, including the focus on a single class of objects that is common in biographical approaches in archaeology and anthropology. More importantly, I suspect that my approach to objects is not symmetrical enough. Participation in the Blurred Lines workshop would be a great occasion for me to get my preconceptions exposed, challenged and harmed. My input would be an unfinished article on Vollgriffdolche, in need of a symmetrical makeover. To ensure engagement I will bring cardboard ‘replicas’ for the complete collection of Italian Vollgriffdolche. My current project aims to consider style and authorship in the monumental architecture of 3rd millennium Syro-Mesopotamia. My PhD, completed in 2014 in the Department of Near Eastern Languages and Cultures in Frankfurt (Main) within the Research Training Group “Value and Equivalence”, dealt with the same body of material but was more focused on technology and patterns of construction. Thus, while I know the archaeological material well, my hope is that the workshop will help me approach my data in new ways by fitting them into diverse conceptual frameworks. The Blurred Lines Workshop would give me the opportunity to broaden my research question through contact with anthropologists and archaeologists whose work looks at the link between the conceptual and material frames of reference. This link would first be systemic, considering the concept of Style and how recognition patterns affect how we perceive elements of material culture. This perception is by necessity done today by archaeologists, who relate those modern patterns to hypothetical patterns in ancient times. Authorship comes in as a personal relationship between the conceptual and the material, and as such might provide a hermeneutic approach working in tandem with the more structuralist approach that the systemic discussion of style might provide. While we may have little data on Syro-Mesopotamian architecture from the beginnings of history, an analysis of Style and Authorship should yield a better understanding of the synchronic and diachronic elements of continuity and discontinuity present in the architectural record. While these two approaches are those I am following in my current research goals, I would look forward to the opportunity to formulate new paths of inquiry, and discuss those possibilities with others who have experience in those directions. My name is Johana Caterina Mantilla Oliveros. I am originally an Anthropologist with a Master’s degree in Archaeology from the University of the Andes in Colombia. Since August 2014 I’ve worked as an associate researcher (Wissenschaftliche Mitarbeiterin) at the Ibero and Latin American History Department at the University of Cologne. My current research focuses on the archaeological analysis of the cultural landscape associated with Maroon settlements in the northern Coast of Colombia during the second half of the 17th Century. Despite the perception that colonial authorities in Cartagena de Indias had about these territories being hostile and wild, territorial mobility allowed Maroon communities to connect spaces and retain political and economic control over them at least until the beginnings of the 18th century. The continuous transfer and the displacement of inhabitants from one place to another, as well as many different objects and animals across the region known as “Los Montes de Maria” support this idea. I am interested in attending the Blurred Lines Workshop because I believe that the contemporary attempts to work (and think) symmetrically, allows to question the historical relations that we – human beings – have created with “non-humans” in order to inhabiting a place. Those reflections are fundamental not only for the practical proposes of my project, but also for the discussion regarding the perdurability of non-symmetrical relations constituted by 1) Being, 2) the human with non-human relations and finally, 3) of the production of knowledge. Spending some of my research time in London over the last three years, I was constantly intimidated by the fact that everybody working on various archaeological PhD’s seems to spend an incredible amount of time of his research on developing a thorough theoretical background for his study. The feeling of intimidation was mixed with the suspicion that it probably would also be in the best interest of his or her research to spend more time on trying to understand the material itself first. But then again, this might only be because I am educated in the German classical-archaeological tradition, which widely ignored most of the Anglo-American theoretical achievements over the last decades. In my approach of studying the over thousand pottery objects within my thesis, I – probably out of laziness – decided after some initial catching up on theory to go “back to the object” (to quote the name of the recent Festschrift for A. Furtwängler “Zurück zum Objekt”) instead, rather then looking through the abundant books and papers on archaeological theory to find the best theoretical frameworks into which I could press my data. To not be understood wrong here: studying theory definitely helps in many ways, because following up on the ideas of brilliant (wo)man always widens your horizon! My problem lies more on the applying side. Because starting too soon to look for the “right” theory (or already being provided with one) does, as I witnessed, already imply that you are also accepting all the deductions of the theories creator. This might come in handy if you have no idea where to go whatsoever, but could also be considered as a cop-out (since you do not have to think it through yourself). So at what point should theory step in to get through the blurriness we are facing when dealing with human behaviorism and its material legacy? When do we reach the limit of common sense and have to rely on theory? And by doing that, how can we keep our awareness up that anthropological and archaeological theory, no matter how got and well adjusted it is, never gives an actual “result” but just a better approximation of how things might have happened or what the motives behind certain observations are or have been? I graduated in art history. Throughout the years, I realized that prevalent approach to architecture as production of physical objects for certain purpose independent of their social and political context and of its inhabitants and city dwellers is not sufficient. I became interested in mutual influence of non-human and human actors in the process of buildings‘ construction and inhabitation. I realized that not just humans mould physical forms according to their needs and wishes, but also things, materials, technologies etc. mould and limit humans. I started my post-graduation studies three years ago. I chose Brazilian self-managed architecture as an interesting blend of collective living, social housing, participation practice and attempt for broader social change. Financial resources for construction are limited and for this reason special technologies are developed which have a whole set of consequences. In the field research I have been applying symmetrical approach to map inter-relations of all the actors. When I was searching for an appropriate methodology for this research, I found an article “Give Me a Gun and I Will Make All Buildings Move: An ANT’s View of Architecture” by Albena Yaneva and Bruno Latour. It expresses the criticism of common approach to architecture in similar way as I initially percieved it and opens alternative ways to understand building environment. Gradually, I became convinced that this research framework is well-suited for my research. As an art historian I need to consult frequently my work with sociologists and anthropologists who are familiar with ANT and science and technology studies. I would be very thankful to participate in Blurred Lines workshop to deepen my research approach and learn about other’s research experiences. 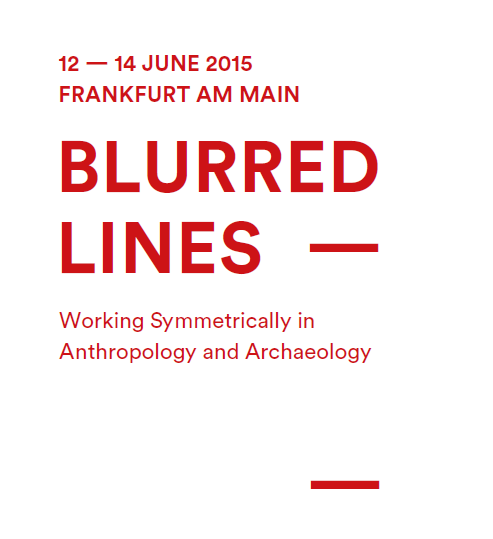 What convinced me to apply for the workshop Blurred Lines – Working Symmetrically in Anthropology and Archaeology is the friction between its title and its subtitle: how can one imagine a symmetry between two entities if the line against which the symmetry is (re)constructed is blurred? The example of a shattered mirror exemplifies such a breakdown of the distinction between what exists and how we can access it: is the shattered image of myself a causal effect of how I am or how the mirror is? In my own post-doctoral research on social relations among Luo-speaking people of Western Kenya the question of how to distinguish between reality and representation resurfaces as a question about who constitutes one body with me and who belongs to a different body. A question that, due to blurred lines between biological and social bodies, ultimately cannot be answered. However, due to the fact that living with such deep uncertainty is impossible, Luo understand their own culture simultaneously as a way of assessing reality (“the other has to be a part of me because he gives freely”) and a result of that reality (“the other gives freely because he is a part of me”) and thereby offer an ingenious practical solution to an unsolvable theoretical problem. In contrast to Luo who, as engaged human beings, have to make ad-hoc decisions that can rule over life and death, I find the following idea, which I believe lies at the fundament of the workshop, worth reflecting on: what if anthropologists and archaeologists as detached scientists decide to discard the question of what is real and what realizes the real? What if they stop pretending to be able to give an ingenious theoretical solution to an unsolvable theoretical problem and instead start to understand their sciences as truly empirical? What if they start to understand the assemblages of things that present themselves to their senses as realities sui generis and stop attempting to understand the way of how they are constituted? Following this deeply anti-hermeneutical path, which I hope will be explored through in-depth discussion of empirical data presented by other workshop participants, allows to understand a sword found in an archaeological hoard as either a sword (trajectory of the naif) or a potential to see the world in a radically different way (trajectory of the sophist), but, perish the thought and thereby beware of boring us, not as a sign of something else. My name is Martina ███████. I am a first-year PhD student of anthropology at the Faculty of Humanities, Charles University, Prague. Looking for a theoretical and methodological framework for my research, I encountered symmetrical methodologies in social sciences that led me to my current supervisor who introduced me to Blurred Lines. My dissertation project is concerned with pregnancy in the urban space of Lima, Peru´s capital. Specifically, I am interested in how pregnant bodies are co-produced in the interaction with the materiality of Lima´s different socio-economic districts, within-and-through the processes of circulating things, people, practices, services, institutions. As a comparative basis, I am looking to delimit three to four “representative” areas based on features such as the socio-economic status of their inhabitants (or “the class”), “race” (or la casta), or education. More specifically: I will look on varied practices and processes co-forming the bodies in the habitus and aesthetics of their districts; How district-specific forming aspects shift, leading, then, to forming different bodies; What kind of pregnant-body representations tend to dominate (in) the public space and how they are reflected in everyday practice and preferences. Secondly, I will ask about the conception of conception and related convictions; How woman´s social status/role changes regarding to the pregnancy of her body; When the mother/baby and a person are born. Thirdly, I will want to find out how women themselves experience and enact their pregnancy; How pregnancy alters their practices. Fourthly, I will wonder about the constitutive role in pregnancy of the male-female interplay – how the male aspect is enacted in pregnancy. I would hope my workshop participation would help me to further develop my research design and open a deeper insight into the symmetrical approach. I would expect to gain inspiration for reworking my mindscape and increase (the awareness of) my “symmetrical sensitivity”. my name is Norman Wetzig and I am currently working on my PhD thesis at Martin-Luther-University Halle-Wittenberg/Germany, where I also received my M.A. in Late Antique Archaeology and Byzantine Art History. The thesis’ working title is: “The double province of Phoenicia as a Late Antique economic area.” and is funded by the DFG Research Training Group 1878 „Archeology of Pre-Modern Economies“ hosted at the universities of Cologne and Bonn. My key aim in writing on that Levantine topic is to not just provide insight into the materiality of the Late Antique economy, but to also enable modern day Lebanese society to built on their material heritage. In the past years socio-cultural and ethnological approaches have mostly been focussing on the identity-discourse of Lebanese society, whilst an overarching approach focussing on the material and thus tangible heritage was rather neglected. Using landscape and land-use reconstructions, monuments and infrastructures from the past and the present in a transdisciplinary discourse to link archaeology and anthropology with today’s Lebanese society and economy will enable us to use the permanence of material and materiality to engage in a discussion on how we can link the lives and circumstances of people in the past with those of today and tomorrow. In my opinion the Blurred Lines workshop is an ideal oportunity to test and discuss the methods mentioned above, without attempting to reformulate any theoretical framework archaeology and anthropology offer us so far, but to put the material evidence and its history to an intelligible use for the sciences and humanities. Affiliation: PhD Student, University of the Basque Country–Institute of Heritage Sciences (Incipit), Spanish National Research Council (Santiago de Compostela, Spain). PhD Directors: Felipe Criado-Boado and Alfredo González-Ruibal. My PhD project examines two related problems: first of all, how to investigate processes of ruination regarding fragmentation and integrity. Secondly, it focuses on how to respond archaeologically to our contemporary incapacity of narrating conflicts and destructions. By combining the research of the social context of remains from the contemporary past and their transformation during the archaeological investigation, those problems will be connected with the possibility of reactivating the potentiality of the past. For many, the return of things has supposed the reintegration of the past in the present, but the problem is that this return has happened in one precise state of the Modernity’s Project where this reactivation is in question. If the XXth century was the most violent and destructive one, the beginning of the XXIst is a moment when we are forgetting its aftermaths, focusing on some of its remains but still ignoring others. Following Paul Connerton’s conclusions about the difficulty of Modernity to remember, I propose to extend this idea as one consequence of the radical changes imposed by the industrialization and the imposition of consumerist behavior. Walter Benjamin wrote about the loss of experience that defines the West after the First World War. Now we are in its extension, after our definitively breaking with its last consequence: the complete disappearance of the non-consumerist ways of life. The thesis will explore that rupture as the principal cause of our current redefinition of materiality, and one point of departure to rethink the permanence of conflict in the way it has changed cultural landscapes. I have high expectations of your workshop proposal as an opportunity to debate these themes, and methodologically increase our understanding of modern materials. It is not only that Archaeology needs to reclaim the integrity of things, but it also needs to take it seriously when the very otherness of things seems impossible to get properly. This means it should not only think, but also act symmetrically. In my recently started doctoral research (called Workers of the New Era: Ethnography of young migrant workers, labor market and changes in manual occupations) in the field of Social Anthropology I am interested in the political economy of labor in the contemporary Czech Republic. Empirically I focus on the growing phenomenon of young migrant workers, mostly from the Eastern parts of the EU, who work, travel and move constantly across EU. In the spirit of multi-sited ethnography (Marcus 1995, further elaborated eg. in Burawoy et al. 2000 as global ethnography) I aim at joining the transnational temporal workers in their quests for jobs and while spending time and money in the breaks. I will also follow things circulating among workers, such as packages from their families, presents home, money flows and infrastructures emerging among locations, job opportunities and workers. Multi-sited configuration goes in my research hand in hand with symmetrical anthropology approach and actor-network theory (eg. Latour 1987, Law 1999). Kayaalp (2013), among others, shows the proximity of multi-sited research design with Latour’s “sociology of associations” (2005) and in particular that such conceptual connection frames interesting researches (see Kayaalp 2013, Hine 2007). Part of my project consists in archival work of studies of the pre-1989 workplaces. Archival research associated with the current fieldwork helps describe transformations concerning labor (market/policies) and processes in which a worker of a new era and his/her subjectivity and rationality shape. I am also tempted to look through symmetrical lenses on the factories under socialism and capitalism, since older generation of workers often emphasizes continuity between regimes in the opposition to the often accentuated differences. Since I aim at conducting my research in symmetrical perspective, I would be really interested in joining your workshop. I am a young researcher and still quite inexperienced so I would really appreciate to collaborate with more experienced academics and fellows, nevertheless I hope I could contribute to the workshop too. Burawoy, M. et al. (2000). Global Ethnography: Forces, Connections, and Imaginations in a Postmodern World. University of California Press. Hine, C. (2007). Multi-sited ethnography as a middle range methodology for contemporary STS. Science Technology Human Values 32: 652–71. Kayaalp, E. (2013). ‘If these machines could talk…’: experts, cigarettes and policymaking in Turkey. Social Anthropology/Anthropologie Sociale 21(4): 479–491. Latour, B. (1987). Science in action: how to follow scientists and engineers through society. Cambridge, MA: Harvard University Press. Latour, B. (2005). Reassembling the social: an introduction to actor-network theory. New York: Oxford University Press. Law, J. (1999). After ANT: complexity, naming and topology, in Law, J. and J. Hassard (eds. ), Actor-network theory and after, Oxford: Blackwell, 1–14. Marcus, G. E. (1995). Ethnography in/of the World System: the Emergence of Multi-Sited Ethnography. Annual Review of Anthropology 24: 95–117. My Ph.D research deals with violent treatments of enemies and prisoners during the New Kingdom Egypt (c. 1550-1070 BC). They include torture (caging; beating and harassment; sun exposure), mutilation (hand cutting; phalli cutting; ears cutting; eye removal; branding) and execution (burning; impalement; decapitation; hanging upside-down). The attestations are visual and written with scarce bioarchaeological evidence (often problematically ethnically attributed based on culture-historical “pottery equals people” premise). My aim is to explore the relations between violence and the body of Others by comparing the treatments of enemies and war prisoners with those violent treatments of the criminals in Egypt or the damned in the Egyptian Underworld. The workshop concentrating on working symmetrically in anthropology and archaeology can prove beneficial for my research on many levels. Firstly, because I deal with bodies as subjects and objects of violence, as arenas for violence, intrusion and fragmentation and with body parts as corporeal fragments, but simultaneously as potential trophies and commodities. Violent treatments produce blurred lines between body parts and things. Secondly, because certain violent treatments are not exclusive for enemies and war prisoners but other Others such as the criminals and the damned, thus potentially blurring the lines between the world of the native and foreign, living and the dead. Finally, my participation in the workshop could help me to critically review my work done so far. My contribution to the workshop is a body centered research which does not a priori privilege the body but allows it to be understood as a thing, primarily a thing which can be hurt in many different ways, using many different methods, elements and other things. Additionally, working on both visual and written evidence of a literate society allows closer look at the meaning levels behind the violent treatments of the body. I am enrolled in the PhD program in Pre-history and Archaeology at the UNIARQ (Centre for Archaeology of the University of Lisbon), integrating also the research group “Interactions in Iron Age and Roman Times in the Western Iberian Peninsula”. Since my research work focuses on material culture, specifically black gloss tableware imports from Italy between the 2nd and 1st century BC, I consider very valuable in theoretical terms combining into my research an anthropologic approach for the interpretation of the use and consumption of this material in ancient Portugal. Unfortunately, in the archaeological domain, this kind of approach is seen with some skepticism by scholars and this is the main cause of the infrequent occasions in which it is possible to share ideas and improve methodologies. On the other hand, many works on material culture are mostly concerned with theoretical discourses without suggesting new or different ways of treating the material objects. For these reasons, it would be a great experience for my research to take part in the workshop “Blurred Lines” because of its operative statement and its multidisciplinary approach. In addition, I consider indispensable to be involved in an interesting working method with significant potentialities for my research in the future. Currently, I am collecting data from my case studies, drawing, counting, and analyzing statistically the materials; but simultaneously, I feel the need to go beyond the standard methods and approaches. Looking for other possibilities seems to me the main purpose of the workshop and it would be very rewarding to contribute with my personal experience in a mutual exchange of suggestions and intentions. Essentially, it would be very useful talking with other researchers with the same concerns. This occasion would be relevant for my objectives as a researcher.